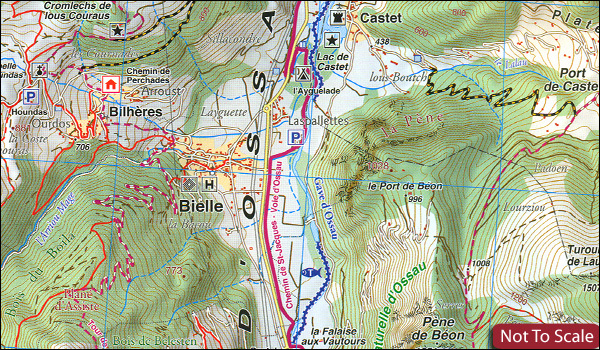 French Pyrenees of the Béarn region, from Tardets-Sorholus to the western part of the Pyrenees National Park including the Ossau and Balaïtous massifs, on a contoured and GPS compatible map at 1:50,000 from Rando Editions with topographic base provided by the IGN, highlighting local and long-distance hiking trails, cycle and mountain bike routes, etc. Topography is vividly presented by contours at 20m intervals enhanced by shading and graphic relief, plus colouring for woodlands and brushwood. An overprint highlights waymarked local and long-distance trails, including the course of the GR10, as well as other hiking paths, indicating difficult sections and traverses across ice. The map also highlights recommended cycling and mountain biking routes. 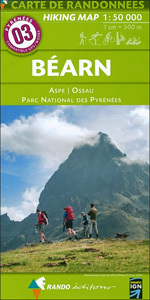 A wide range of symbols presents different accommodation options (campsites, mountain refuges or lodges, gîtes d’etape), locations for various recreational pursuits (mountain biking, climbing, hand gliding, canoeing and rafting, etc), historical and cultural sites, tourist information offices, etc. 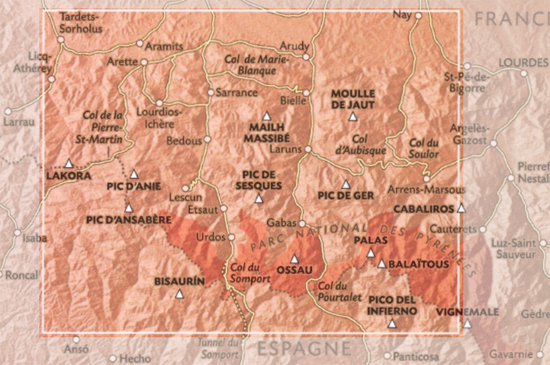 On the Spanish side of the border, main hiking trails are highlighted but other recreational and tourist information is limited. The map has a 2km UTM grid and its map legend includes English.